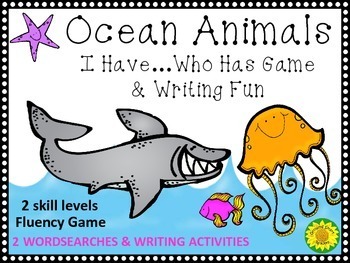 Ocean Animals Game and Writing Fun! Fluency/Vocabulary/Writing all make this a good combo for playing a game as a class or large group. Collaborative activities build positive relationships and everyone is a team player! 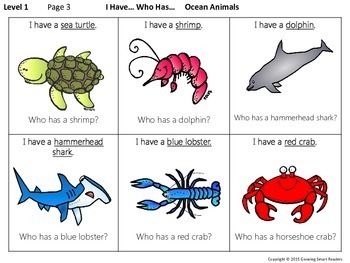 “I have…who has” games are fun confidence-building activities for hesitant readers. Besides fluency, it can be used to reinforce writing skills for spelling, or narrative writing. It is an excellent way to reinforce vocabulary (i.e., homophones, parts of speech, and multiple meanings --when applicable). 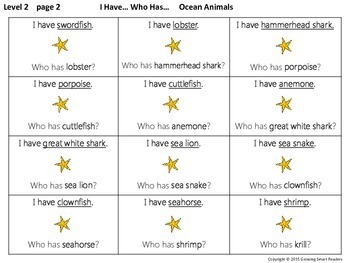 There are 2 levels for reading ocean animal names. See below. Once students are familiar with thematic or content words, they are able to use them with confidence in their writing. “I have…who has” games are an alternative to worksheets. Time them to see how automatically they can read these cards! 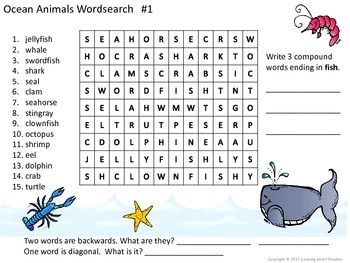 You will find that the theme writing papers and wordsearch activities are additional ways to reinforce the vocabulary. These extra activities can be included in a writing center, or offered to fast finishers. slightly harder than those in level 1. Thanks for checking this out!